I ment to get this little goodie out for everyone way before this. I bought a new laptop ~ which I'm loving since it's sooo much faster than my old PC ~ & it took longer than I figured transfering all my files. You never realize how much digital scrapbooking stuff you have until you need to move them to another computer!! LOL. So now I'm pretty much set up & ready to roll. I have some past freebies to add to the sale rack in the store, so that's my next project for next weekend. 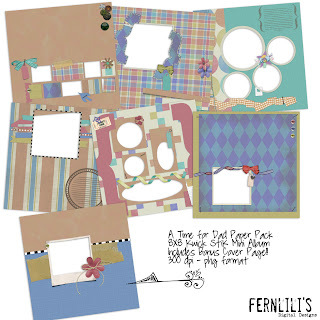 In the mean time I have a little mini album freebie. Made with A Time for Dad Paper Pack this mini album is perfect for Dad or just for everyday. Enjoy. As always please do not share this link, please direct those interested in my freebie to my Blog. Thank you.